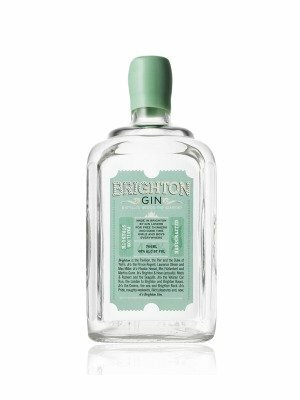 Brighton Gin is a popular Craft Gin available from TheDrinkShop in 70cl to buy online. Visit TheDrinkShop for the best price for 70cl of Brighton Gin or compare prices on our other Craft Gin products. Clear and bright in the glass, the subtle notes of juniper come to the fore as you swirl, releasing sweet-scented fresh citrus and a touch of spice. The persistent hints of orange make this gin gentle and approachable. Brighton Gin, whose other botanicals include angelica, lime and milk thistle (well-known for cleansing the liver - helping you to detox as you tox, so to speak), makes a deeply refreshing G&T - in which instance, we recommend serving it with a slice of orange to bring the fresh orange peel botanical to the fore. Versatile and adaptable, Brighton Gin also works brilliantly as a Martini and is exceptional as part of a Negroni. This is a subtle, ruminative gin and, thanks to its softness, Brighton Gin is also delicious sipped neat, over ice with a slice of orange. Where to buy Brighton Gin ? Brighton Gin Supermarkets & Stockists. You can buy Brighton Gin online in most retailers and find it in the Craft Gin aisle in supermarkets but we found the best deals online for Brighton Gin in TheDrinkShop, 31dover.com, DrinkSupermarket.com, and others. Compare the current price of Brighton Gin in 70cl size in the table of offers below. Simply click on the button to order Brighton Gin online now.